For some time now I have wanted to take a closer look at the production methods and processes employed by the farms and breweries that we trade with. We know the people, we speak to them on the phone, by email, by text, we collect the products in their packaged form, we put them on our site, we appreciate individual characteristics from past tastings, we promote and sell them in our own way and we pay the bills when they arrive. But do we appreciate the long hours, hard graft and creative love that each and every one of the brewers and cider makers, that we feature, pour into their products? Maybe not fully. Do we really know what goes into making the ever growing array of quality Cornish produce that we offer? The answer to that, if I’m brutally honest, is very little - or at least not enough. So, I have decided to do something about that. We intend to ask our trading colleagues to let us take a peek behind closed doors so that we can understand them and their products better. We strive to be an appreciative and informative retailer and provide you, the consumer, with some knowledge, interest, and added value in the form of this blog. I’m going to start, not with a brewer, but an accomplished cider maker. Nigel Smith, together with his wife Biz, produce Touchwood Cider from their farm and orchard in Mithian. I first met them three years ago when I was busy trying to add Cornish Cider to our portfolio, we found their website first and made contact... From that first meeting (and tasting!) I knew we were on to a winner, the cider is utterly stunning! A bright, lightly sparkling, medium sweet 5% ABV apple cider, that absolutely blew me away from the first sip. I’ve not been disappointed since. Back in the eighties, when Nigel bought his property, there were no apple trees but there was a cider making history, in fact the place is steeped in it. Nigel’s house is a converted cider barn, a relic of times gone when smaller farms survived in a more self-sufficient way and produced most of what they needed to live and trade day to day. 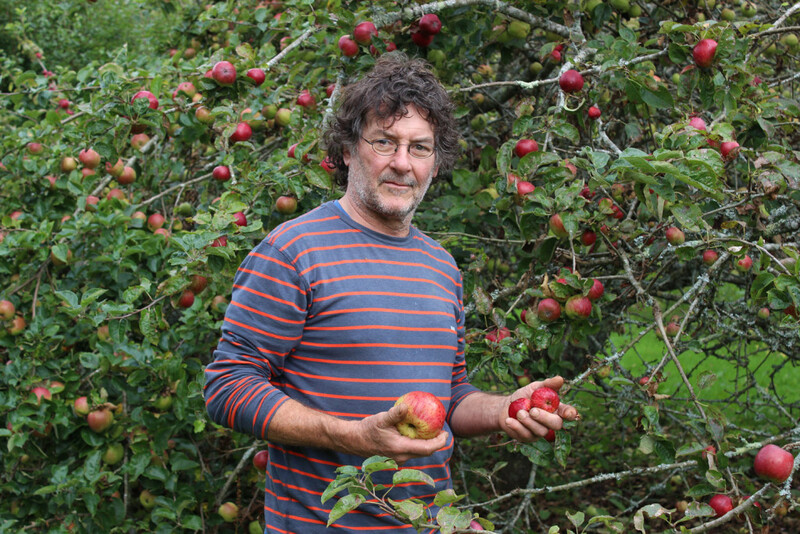 Armed with an extraordinary long term vision and a determination to return cider making to Woodlands Farm, Nigel joined a Cornwall County Council scheme to reinstate old apple varieties to the county. Planting started and some thirty odd years later Nigel has Orchards made up of a similar number of apple varieties, twelve to fifteen of which form the main ingredients for production. Realising that the elements were going to be challenging (the area is 100/110 metres above sea level and only a couple of miles from the coast) Nigel first needed to plant ‘barrier’ pine trees to protect the apples from the excesses of the Westerly and North Westerly sea winds, so his orchards are now neatly tucked into their own pine bordered enclave. Nigel has continued his planting policy, he has another ‘new orchard’ adjoining the original one, which has trees approximately five years old, he talks knowledgeably about grafting. (A process he taught himself from information gleaned from the internet) and about tree size and classification. He showed me a young tree variety, ‘Katy,’ which is successfully growing from his own grafts. During the growing season, and before apples start to fall, Nigel grazes the whole orchard area with his flock of sixty odd white geese – his ‘girls.’ This policy keeps the grass down naturally, provides nutrients for the soil in the shape of droppings, and helps to keep the bugs at bay too. There are also some thirty-odd beehives dotted around the Orchard, apart from providing the farm with top grade honey; the bees ensure that pollination is at an advanced level throughout the Orchard, absolutely vital to ensure good cropping. Nigel also avoids pruning wherever possible, this reduces the risk of Canker in the trees and keeps them healthy. If you think about this logically it all makes perfect sense – keep the growing environment protected without pesticide or herbicide, provide the best nutrients to promote growth and health in the trees, ensure rapid pollination and what follows must be top quality fruit from heavily cropping trees. There is absolutely no substitute for good preparation and this gives Nigel the very best base to produce the highest quality cider. Nigel believes that the fruit should be allowed to fall before it is harvested, the ‘ready’ fruit is gathered from the ground and once it is down it needs to be collected reasonably quickly, within a few days. This is all done by hand with buckets and trays. Nigel has some help with this; students on the WWOOF scheme (World Wide Opportunities On Organic Farms) are on hand to assist. (At the time of my visit there were members from France and as far as Tasmania). The apples are then washed and pressed to produce the all-important juice which is stored in tubs before being transferred into tanks where it is allowed to ferment naturally. No added yeast is used; the naturally occurring yeast on the fruit takes care of this task. Over the next 12 months maturing takes place, secondary fermentation takes place from yeast occurring in the equipment and surrounds, like cheese making, racking seven times helps with clarity, blending and the addition of sugar renders the product ready for cold sterile filtration at the bottling plant before being returned to Nigel and Biz who currently are hand labelling their bottles. No sulphites are used in the process so the finished product really is as natural as it can be. This is truly a labour of love, but the finished product, as I said earlier, is utterly stunning. I am going to wrap up this piece with a huge thanks to Nigel and Biz for allowing me to see ‘behind closed doors’ and to sum up the farm, the process, the people and the product in one word … FANTASTIC! If you would like to try Touchwood Cider, (the name is derived from the connection to Mother Earth and from folklore - good luck) it is available in 500ml bottles from out bottle store. You can find it here: http://www.cornish-bottled-beer.co.uk/apple-cider/touchwood-cider.